Terrajoule technology is not the expected solution to the worldwide need for expansion in reliable, dispatchable, distributed and renewable energy. A particular distinction from the expected is that Terrajoule technology does not require massive investments in new science, new materials, and new manufacturing capacity to reach large and economic scale. In fact, Terrajoule exploits an old-fashioned technology: Reciprocating steam piston engine technology that reached the pinnacle of its deployment in the 1930s. These embodied the technology sophistication of 300 years of steam engine evolution that drove the industrial revolution. Steam engine technology is from the past, but was never obsoleted as a flexible and efficient means to convert thermal energy to electricity at the distributed power scale. Steam engines were displaced by cheap diesel for marine engines and off-grid power, and by coal-fired power plants with large steam turbines for centralized power. Neither diesel nor centralized power have retained their original economic advantages, while solar concentrator technology has advanced. The wheel turns. Solar concentrators to produce steam. Parabolic troughs are proven and under constant improvement. Terrajoule can use any of the available third-party concentrator technologies: parabolic trough; heliostat/tower; linear fresnel (CLFR). However, for the pressure of saturated steam required by Terrajoule plants, with temperature never exceeding 270 C, parabolic troughs currently offer the most reliable and economic solution. Terrajoule’s partner SkyFuel Inc. supplies the world’s most advanced and cost-effective parabolic trough solutions. Steam engines to convert the solar power in steam to electricity. Efficient at ~1 MW scale, appropriate for distributed power units. Operate efficiently across a wide pressure range, making a radical difference to the quantity of steam that can be used to efficiently charge and discharge a steam accumulator, as compared to the comparatively narrow operating pressure range of a steam turbine. Control power output independent of steam pressure by controlling steam mass flow without throttling, by means of variable valve timing. 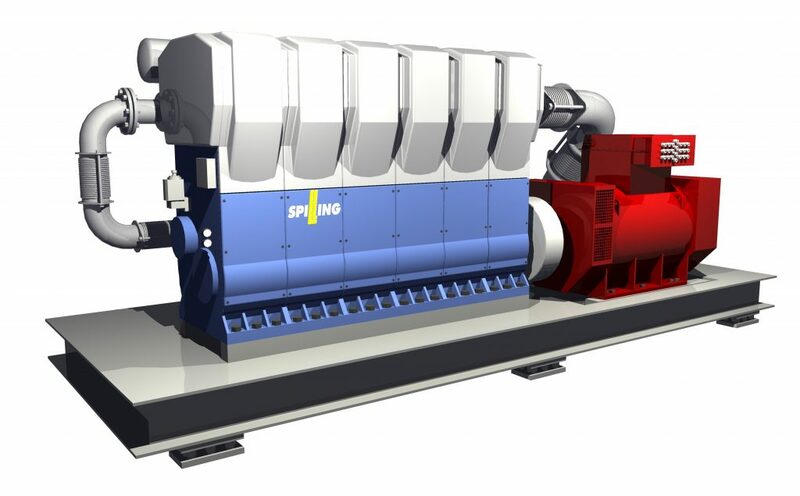 Throttling steam flow is necessary to control the power output of a steam turbine, resulting in a critical loss of efficiency. The ability to control power without throttling is a fundamental distinction between steam piston engines and steam turbines. Energy storage is achieved via a “steam accumulator” built with insulated steel pressure vessels and filled with water. A steam accumulator is commonly used in industry to store steam for storage and supply on demand. To charge the accumulator, steam is injected into water where it condenses, heating and pressurizing the water to store the energy. 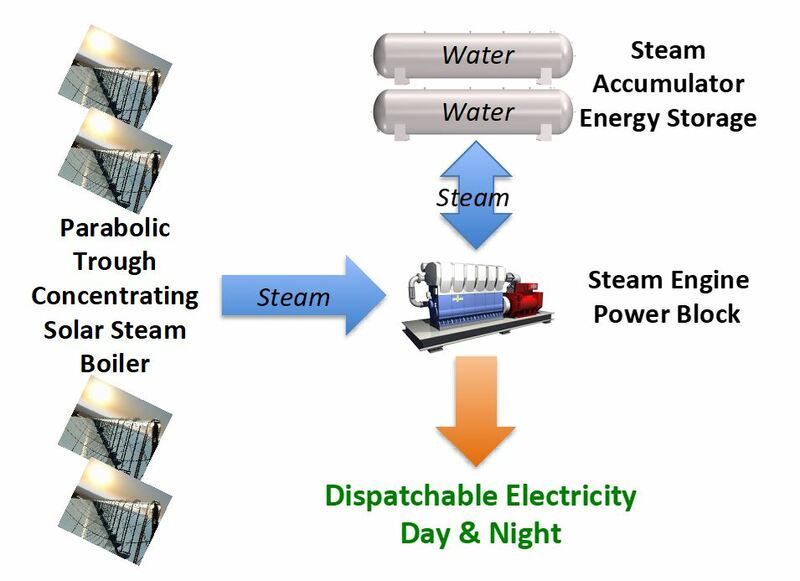 When steam is needed, the stored energy flashes the water back to steam which is used to generate dispatchable electricity on demand, day or night. The result is storage at less than 20% of the cost of batteries, with no degradation, no cycle limits, no toxic or rare materials, and a useful life of at least 25 years.